Vehicle survival kit in the case of a roadside emergency. Be prepared when you are on the road and away from home with one of these car emergency kits in your vehicle. 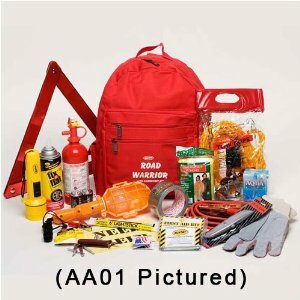 This kit fits most all road emergency situations. All items are packed in a heavy-duty backpack. Kit contains: 2400 Calorie Food Bar – 30 Minute High-Intensity Light Stick – Tow Rope – Auto Spot Light – Jumper Cables – First Aid Kit – Flashlight with Batteries – Fire Extinguisher – Solar Sleeping Bag – Waterproof Poncho – Swiss Style Army Knife – Drinking Water – Leather Gloves Whistle – Duct Tape – Utility Knife – Emergency Instructions and Help Sign – Wet Naps – Reflecting Triangle – Distress Banner.